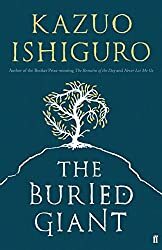 I had little idea what to expect before I began reading Kazuo Ishiguro’s latest novel The Buried Giant, except, that is, that I had enjoyed the other three books by him that I’ve read. They are The Remains of the Day, a brilliant book, a beautiful portrait of both personality and social class, set in an England that no longer exists, a story of hopeless and repressed love; Never Let Me Go, a love story that both shocked and horrified me; and Nocturnes a book of five short stories in which Ishiguro explores ideas of love, music and the passing of time, with a touch of nostalgia and a sense of loss for what has gone or what could have been. I knew that there have been mixed reviews of The Buried Giant and was keen to see for myself what it is like. I loved it. It is different from his other books, but still has some of the same themes I loved in them – the themes of love and the sense of a time long gone. It is also about the passing of time, old age, the fallibility of memory and much more besides, in particular ethnic conflict and the devastating effect of vengeance and hatred. It is set in Britain after the death of the legendary King Arthur, after the Romans have left, and the wars between Saxons and Britons have ceased. But it is a cursed land swathed in a mist of forgetfulness. Attempting to remember their lives together, an elderly couple, Beatrice and Axl, leave their village setting out on a journey to visit their son, who they barely remember. They encounter many hazards, strange and other-worldly. They meet a boatman in a ruined Roman villa, who ferries people to an island. He is under a duty to question those who wish to cross and will only allow a couple to travel together if they can demonstrate their abiding love for each other. But Axl and Beatrice are haunted by a dread that because of their memory loss they would fail such a test, and be separated for ever. How can they prove their love for each other when they can’t remember the past they’ve shared? There are ogres, deadly pixies, evil monks who keep a dreadful beast underground, Saxons – Wistan, a warrior and a young boy, and Sir Gawain entrusted by King Arthur to slay Querig, a she-dragon roaming the land, who by her breath has spread the mist of forgetfulness. It is this hatred that still drives people to commit atrocities, bringing out the worst in human nature. Whilst the past is forgotten, Wistan realises that the old wounds can’t heal whilst ‘maggots linger so richly‘, nor can ‘peace hold for ever built on slaughter and a magician’s trickery‘. It has elements of fantasy, myth and legend, of allegory and adventure and the perils of a quest. It is mysterious, beguiling and slippery, hard to pin down in parts and startlingly clear in others. From a somewhat slow start it gripped my imagination and made me think, trying to pin down just what was happening as the prose is clear and yet ambiguous, in the same way that the mist obscuring the past at times lifted and dispersed a little before returning. Beatrice and Axl are the dominant characters, and I found their confusion as they realise they have forgotten their past and their distress as they contemplate spending eternity apart deeply moving. It is extraordinary and mesmerising! I think it is a book I’ll have to re-read! This may not be the usual book of ghostly, gothic or classic horror of the categories for the R.I.P. X challenge, but it is certainly a fantastic book full of peril, mystery and suspense.